When I was at my mom and dad's over Easter, I couldn't help but bring a couple of craft supplies to do a small project. I ended up grabbing some beads and cord. 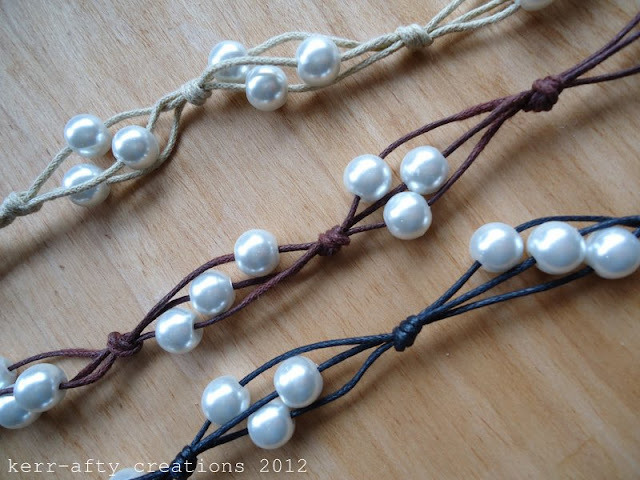 Using this pin as inspiration I thought these bracelets would be a cinch to whip up. The braiding cord (that's what the package called it. I had wanted to use hemp but that stuff was too pricey for El Cheapo over here!) had three different colors in the package so I made a couple of brown, black, and natural. I think they are uber cute and could be worn with a formal or casual outfit. 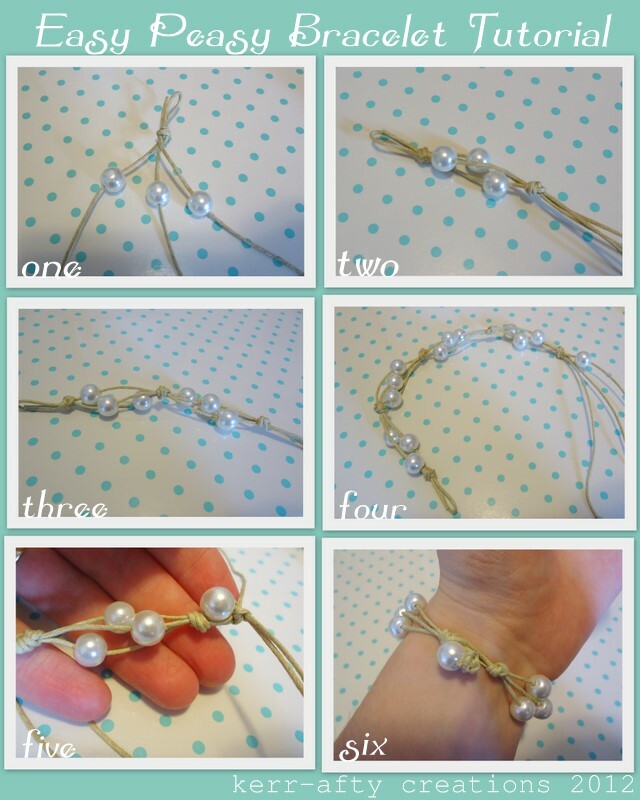 It's as simple as putting on beads and tieing a knot, I found the size that fit me best was four sections (pic four). I didn't measure the sections, just eyeballed it. At the end throw on one single bead tie another knot (pic five) and that will go through the starting loop as your clasp. Isn't that easy and quick? These would make great little gifts, Mothers Day is coming up! With this tutorial and the one I shared on Tuesday you think I would have done a series like 'Jewelery week' or something. Ha. It looks so cute but quick and easy! I'll pin this one for later! Thanks for sharing! Cute and simple. Love it! Justine, The bracelets are so feminine and pretty; and thanks so much again for being so generous and posting the tutorial to make them. How did you find large hole pearls? Patti, I just bought a couple of pearl necklaces at the dollar store and cut them off their string. They just happened to fit the cording through! These look like Allison Craft jewelry! The brand is so expensive! If you're going to ream real pearls, make sure you have the pearls and the bit under water-pearl dust is very dangerous if inhaled! 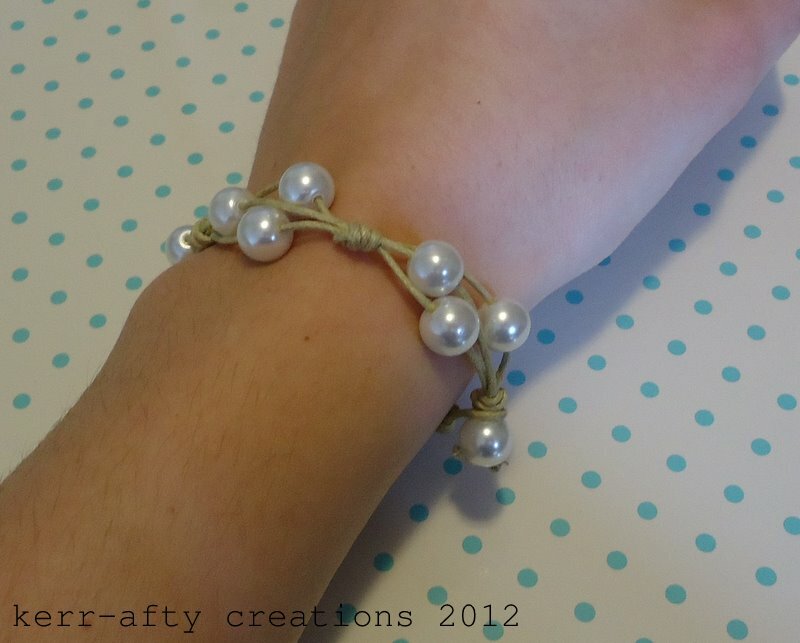 Love the pretty pearl design! Feminine without being too blingy! Couldn't find a contact. Ok to feature it on my blog so others can come visit? Thanks! Totally fine, as long as you link back to this post and/or my blog. Thanks! how long did you cut the cord to make these? I love making pearl and leather jewelry! I can't wait to make some of these for a change! Did you just make a slip knot in between each section? No it's not a slip knot, just a basic knot. 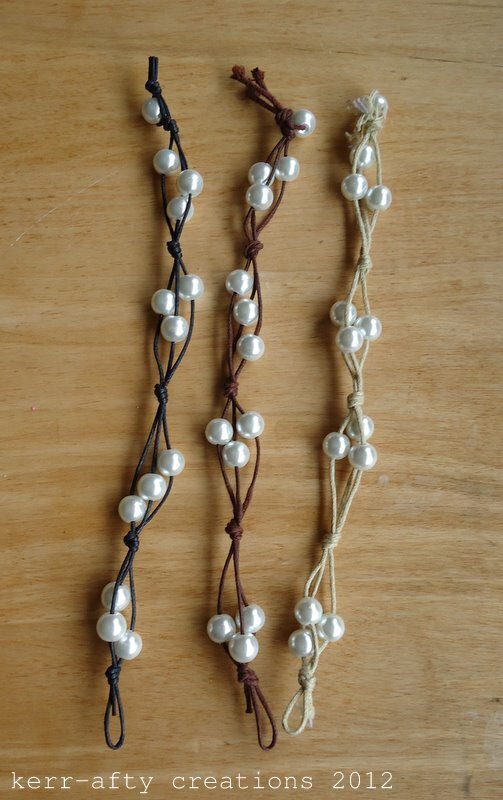 Holding all three strands together, tie in one knot tightening when the placement is where you want it. Hope this is explanatory enough. Love this....can't wait to make them......!!!!!!!! Love this simple but pretty design...I have all the stuff already too! What a great easy idea! Thanks for sharing. how presh , elegant and so simple!!! I am a little stressed lately, so I am having trouble figuring out the third string. Where or how do I get that? Thanks. My name is Krista, and I am an editor for AllFreeJewelryMaking.com, a free resource for jewelry tutorials. I would love to feature some of your fabulous tutorials on our site, with one photo and a link back to your site for the full tutorial so that none of your content is reproduced. Please let me know if you are interested in being featured, and I'd be happy to link up to some of your projects on AllFreeJewelryMaking! I can either choose the projects to feature on the site, or if you prefer, you can send me links to projects you are interested in having featured. Also, if you'd like, once we have linked up to at least two projects, I can set up a designer profile for you with a brief bio and links to your site/blog and social media resources. Please let me know what you think! I hope we can begin working together soon. I like this, very simple!! I'm def gna make one :-) u did a great job! And btw u made me laugh girl, el cheapo lol i feel ya!! That made me smile bc i can relate! I love hearing from you! If this is your first time here, say hello. I truly appreciate any comments given and read every single one. A new comment seriously makes my day. Thank you so much! Hello! I'm Justine and this is where I share some of my creations as well as everyday moments. I come from a line of crafty women and hope to inspire as well as encourage not only my little ones but maybe a few of you as well! Folks, we have a Winner! how bout a lil lovin? Text & photographs are exclusively owned by Justine Kerr of Kerr-afty Creations/Just Kerr-afty, unless otherwise noted; all rights reserved. Feel free to use my creations as inspiration but please give credit where credit is due or link to my page. 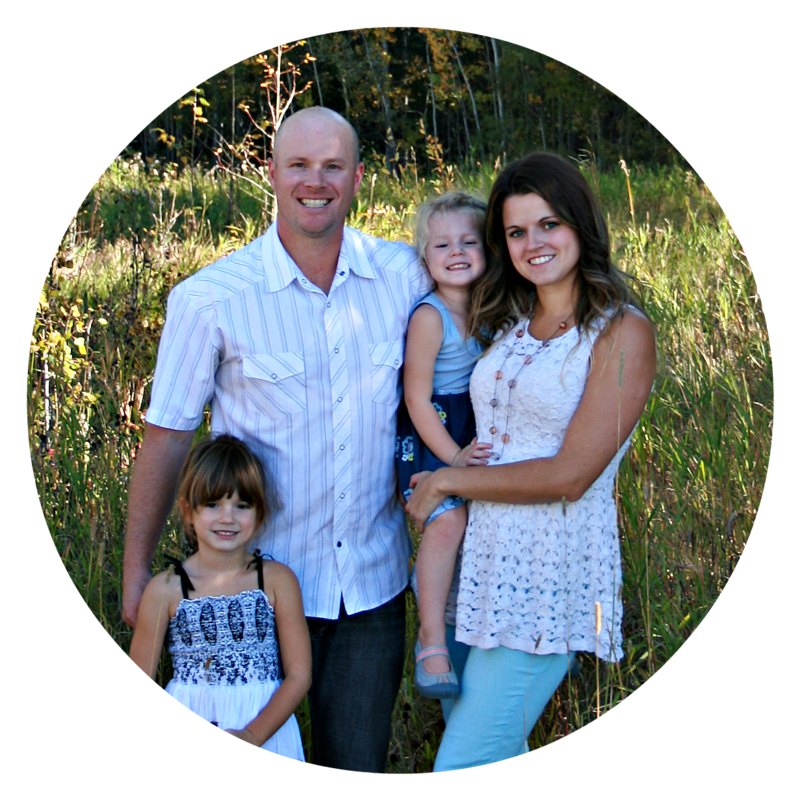 This is a personal blog and is not endorsed by any outside vendor. Thanks!